Bummed. My lil man is having another really bad breakout. Pretty freaked that it seems to have gotten to the top of his left eyelid. Praying that he will outgrow this sooner than later. I am hopeful because I received a recommendation for a doctor that might be able to fix this eczema issue of his. I'm having anxiety about this lately. I'm thinking that right now he doesn't really have control of his hands...so he can't scratch toooo bad but as he grows and gains more control he is going to scratch his skin and it's just going to be a problem. :/ Prayers for an answer to his condition are absolutely welcome. Stay tuned for updates on his skin sitch. Aww, poor guy. My little girl has eczema real bad too. It actually landed her in the hospital when she was 5 months old because it got infected crazy fast and the stuff the family doctors prescribed for her weren't working. It always makes me nervous when it flares up. :( Hopefully you figure something out soon! Yeah it's the first time his eyelids have gotten red and inflamed. It was making me nervous last night but his cream slightly improved it this morning. Phewph. 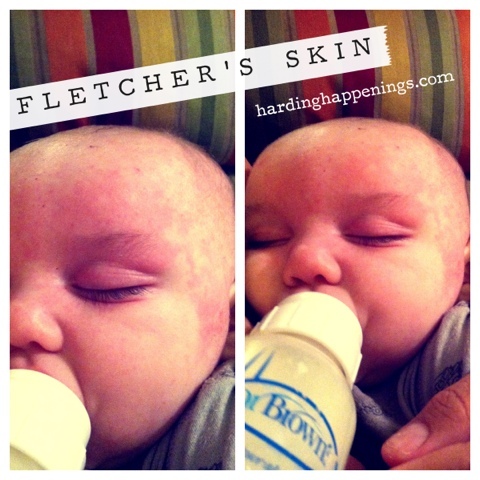 And just yesterday I was talking to a parent with A son that had Fletcher's exact same symptoms red irritation behind knees and in front of elbows. They had some helpful suggestions. This makes me so sad! But I'm glad his cream is helping! Give my sweet little man a hug and kiss from Auntie!! !